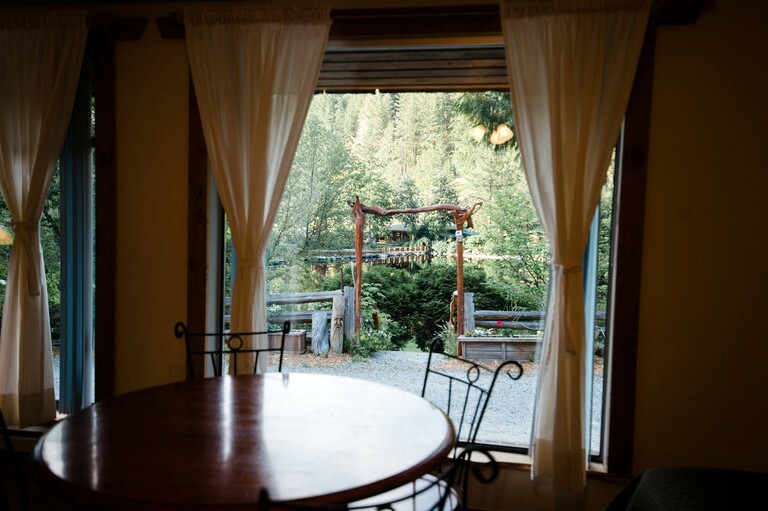 This cottage getaway for groups is located on a lake resort on the beautiful Sunshine Coast, British Columbia, and can accommodate six guests. It has one main room plus a separate bedroom, one bathroom, and a kitchenette. In the first room, which doubles as the main living space, there are two long full-size beds. The room also features a table with four chairs, a wardrobe, and a television. The second bedroom contains another long full-size bed. In the bathroom, guests will find a toilet, a sink, and a combination bathtub/shower. Linens and bath towels are provided. The kitchenette comes with a mini-fridge/freezer, a sink, two burners, a microwave, a coffeemaker, dishes, cutlery, pots, and pans. At the site, guests will find walking, hiking, and biking trails as well as a canoe, rowboat, and stand-up paddle boat rentals for the lake. There are wildlife viewing platforms, a communal barbecue hut, picnic areas, a small beach, an outdoor amphitheater, an onsite pump track for mountain bikers, organic vegetable gardens, a private dock, a wildlife sanctuary, and an Italian restaurant featuring gourmet dishes made with fresh, locally sourced ingredients. For guests staying in tents, there are shared bathroom facilities, separated for men and women, containing toilet stalls, sinks, and showers with hot water. 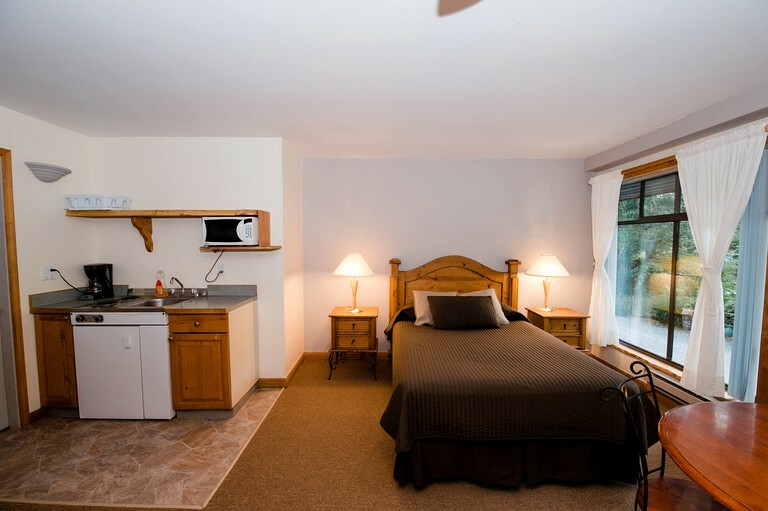 Each of the cottages/cabins features a private bathroom, and both the tents and the cottages/cabins are equipped with power and light. Canoes, rowboats, and stand-up paddle boards are available to rent. Gourmet meals can be purchased at the on-site Italian restaurant. Lakeside yoga classes are also available. A natural paradise full of unspoiled wilderness, backcountry beauty, and outdoor recreation awaits guests at this glamping site located on an 80+ acre retreat near Madeira Park, British Columbia. Situated between the shores of Ruby Lake to the west and the Caren Range Mountains to the east, it is surrounded by old-growth forest—ancient yellow cedars, mountain hemlocks, and silver firs blanketing the landscape with their magnificently thick and verdant foliage. Without even leaving the site, guests will find a treasure trove of attractions, amenities, and facilities all around them. Walking, hiking, and cycling trails wind their way through the woods. Canoes, rowboats, and stand-up paddle boards are available for rentals on the lake. A lagoon and a wildlife sanctuary beckon to be explored. There is even an Italian restaurant that awaits hungry guests with a patio for them to dine on in the warmer months and a wood-burning fireplace for them to warm up at during cooler weather. Beyond the site, the bounty of attractions becomes even greater, with Spipiyus Provincial Park to the southeast, Skookumchuck Narrows Provincial Park to the northeast, and the nearby towns of Madeira Park, Egmont, Garden Bay, and more presenting an array of shops and restaurants. There are also many day trip opportunities, such as the Thormanmby Islands, Savary Island, and Princess Louisa Inlet. At the site, guests can go swimming and fishing on Ruby Lake. They can also go stand-up paddle boarding, canoeing, and row boating with rentals available for all three. On land, they can go walking, hiking, and cycling on the site's various trails. They can also attend lakeside yoga classes and go bird watching at the bird sanctuary. Over 120 species of birds—including bald eagles, blue herons, kingfishers, hummingbirds, and three species of swallows—call the area their home over the course of the year! For dining, guests can visit the on-site Italian restaurant, where they will find gourmet dishes made with fresh, locally sourced ingredients. When the weather is warm, they can dine al fresco-style on the restaurant's patio, when it's cold, they can dine by the cozy, wood-burning fireplace. Near the site, guests can visit Spipiyus Provincial Park to the southeast, Skookumchuck Narrows Provincial Park to the northeast, and nearby towns such as Madeira Park, Egmont, and Garden Bay. For day trips, they can visit Thormanmby Islands, Savary Island, and Princess Louisa Inlet, among other attractions in the region. Some of the site's accommodations are pet-friendly, others are not. All of the accommodations are smoke-free.